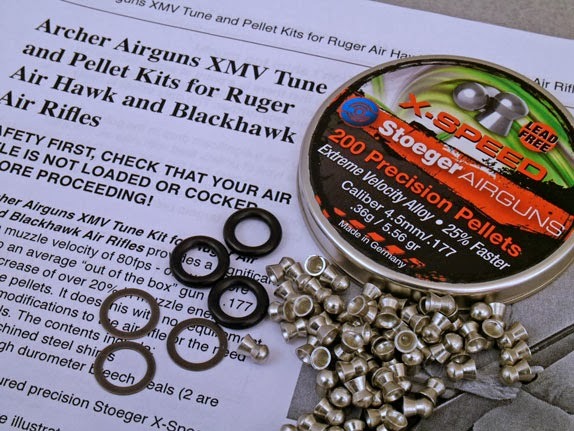 Archer on Airguns: Archer Airguns XMV Tune Kit Also Fits the Umarex Octane. 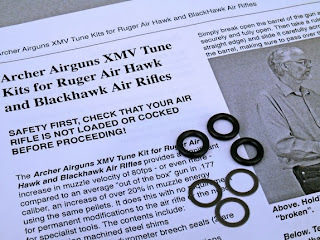 Archer Airguns XMV Tune Kit Also Fits the Umarex Octane. In answer to several emails, I can confirm that the Archer Airguns XMV Tune Kit fits the Umarex Octane airgun, in addition to the Ruger Blackhawk, Ruger Air Hawk and Ruger Air magnum air rifles. The XMV Tune Kit provides high quality replacement breech seals for these air rifles, together with three precision stainless steel shims that can be used to precisely set the position of the breech seal for optimum performance. Even more important, it also gives comprehensive, yet simple, instructions for determining if your air rifle needs its breech seal shimmed as well as how to undertake this simple upgrade. As you would expect, Archer Airguns XMV Tune and Pellet Kit also works with the Umarex Octane, although just in .177 caliber as that is the caliber of the pellets supplied in this kit. Click here for a complete free eBook available that describes both kits and how they can be used to improve the performance of your Umarex Octane air rifle - as well as the Ruger airguns.